Simon and Sarah...the Duke and the gardener's daughter. I love those unlikely and impossible loves. Watching barriers and walls crumble to true love. Seeing the struggle between what was proper and acceptable in society vs what was really in their hearts. It gets me every time and pulls at my heart something fierce. "I wished it had been me," she said softly. "When you were dancing with Miss Stanley and the others. I wished you were dancing with me." He gazed at her unspeaking for a moment. Then he said, "I did, too." Simon and Sara were both wonderful characters. She's caring, intelligent and bold. And Simon is a man who always wants to do what is right. Who will protect his family with everything he has even if it hurts him in the process. You can't help but admire him. The two together...they felt so absolutely right together despite all of the obstacles in their path. There's an ease between them from knowing each other since childhood. That connection where they just feel comfortable. Where you sit back and all you can think is my God these two *need* to be together. They just have to figure it out! You know? As much as I loved the characters Haymore's writing style is what impressed me the most. The pacing was wonderful--never too slow or too fast. The relationship was believable and their struggles real--it never felt outrageous or forced. The world was so vivid, rich and seamless it was like watching it actually happen. Not just reading from the pages but seeing it. She surprised me more than once with twists and turns as the mystery woven into the storyline was investigated. Actually had me gasping and shocked and kept me glued to the pages in anticipation of what would happen next. It was just a fantastic ride. From the hero and heroine to the support cast, the scandal and mystery surrounding the Duke's mother's disappearance. It all just worked for me. 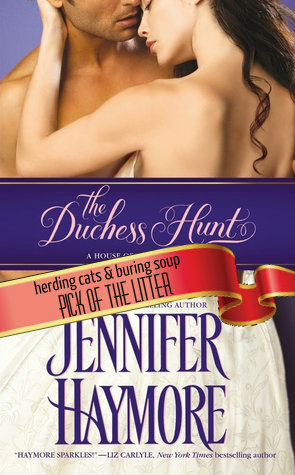 The Duchess Hunt will definitely be one I compare all other historicals to from here on out. It was just that good. Have you ever found a historical like this one that drew you in completely?